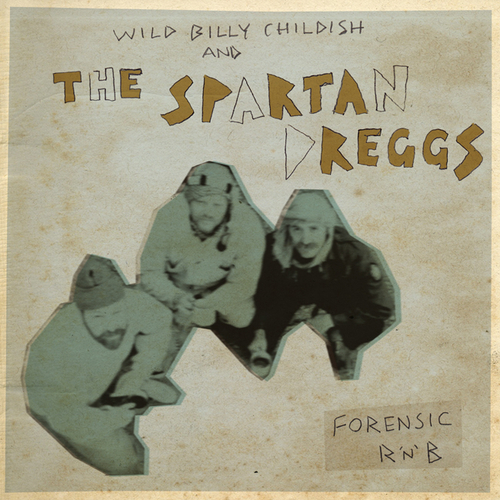 After our mail order singles club earlier this year comes the debut album from Billy Childish’s latest ensemble ‘The Spartan Dreggs. Here be the Spartan Dreggs, Billy Chydish’s new ensemble. The Spartan Dreggs sank from the scum of the Vermin Poets — but kept the same line-up and similar songs. Once more Chydish drives from the back seat, playing tug-boat bass guitar. Wolf, of course, is playing the drum set and lead voice and guitar are supplied by the excellent Neil Palmer. Nurse Julie, with babe in arms, offers up harmony. The Spartan Dreggs, as story has it, were left as newborns to die upon a wintry fen — then spirited away by the Gods to entertain the immortals, singing epics for the tired Muses to hum by death’s door. These hymns took on a life of their own, thereby raising the suspicion of Hermes, Athena and several other deities, that they might inspire humankind to invent their own stories beyond those dreamed up by the far-seeing Olympians. So The Spartan Dreggs were cast back into this earthen mold. DO I UNDERSTAND WHAT THE SPARTAN DREGGS BE? DO I KNOW WHAT THE SPARTAN DREGGS SOUND LIKE? Like a small child who has just said the best thing that’s ever been said, but no one is listening, so do the Spartan Dreggs proclaim their songs. But there is still a sense that no one will ever harken to this new-found choir, heard for the first and last time in a stricken world. Nevertheless, the Spartan Dreggs utter song and sooth for all. Signed: The Dreggs of Yore.